Showcasing the voices of 250 girl singers, iSing Silicon Valley is putting on a benefit concert at the Menlo-Atherton Performing Arts Center on January 23. The program will feature an evening of jazz with singer and bassist, Kate Davis. “Jazz was born here in America and has given rise to incredible female talent: Ella Fitzgerald, Billie Holiday, Peggy Lee, etc,” explains Artistic Director and co-founder Jennah Delp-Somers. “We invited Kate to join us, in this tradition of titan women vocalists, to inspire and excite the girls. “In our first year, we collaborated with folk artist Moira Smiley. In our second year, we sang music from The Sound of Music and Mary Poppins with Broadway star, Ashley Brown. Since its founding in 2013, iSing has been recognized in the community for its innovative teaching, leadership, and commitment to musical excellence. 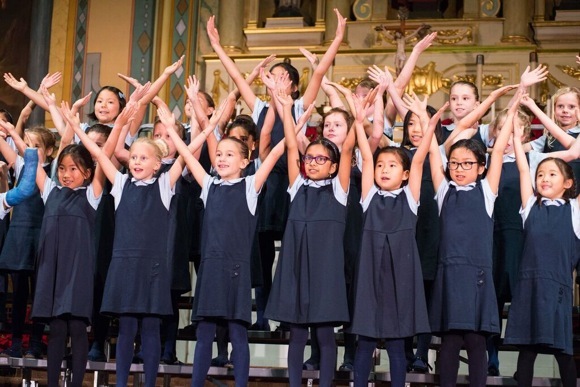 The 501(c)3 nonprofit organization allows girls in grades 1-12 to explore their potential as leaders, creators, and collaborators through choral music. “My two daughters [age 11 and 13] have been involved with iSing since its inception,” said Menlo Park resident Maren Stever. “I saw them go from enjoying music to absolutely loving it. They walk around the house singing in two-part harmony! iSing was awarded a Menlo Park Grant for the Arts from the Menlo Park Community Services Department, receiving $1000, which the group used toward using the Menlo-Atherton Performing Arts Center. There will be two performances on Saturday, January 23, at 4:00 pm and 6:30 pm. Tickets are available online.